Pork that is “par-cooked” has been heated higher than an internal temperature of 137°F (58°C), but less than 148°F (64°C) eliminating any possible trichinella spiralis. When the pork product is heated above 148°F (64°C) but below 154°F (68°C), it becomes fully cooked and ready to eat. This final cooking step ensures the destruction of all sorts of other bacterial pathogenic microorganisms including staphylococcus aureus, escherichia coli serotype 0157:H7 and 0121, salmonella enteritidis, clostridium perfringens, listeria monocytogenes, campylobacter jejuni, shigella, bacillus cereus, as well as various non-bacterial parasites such as cryptosporidium paryum and of course, trichinella spiralis. However, this is a non-fermented product and remains perishable. Please keep it refrigerated. Place the grinder knife and plate into the freezer while you separate the fat from the lean meat. Using a sharp knife, cut all the fat into smaller pieces (for the grinder), then freeze the fat. Cut the meat into 1-1/2 ” cubes and place it into the freezer until it nearly freezes. Grind the nearly-frozen meat using the 3/8” plate and the frozen pork fat using a 3/16” plate. Work in small batches and do not allow the fat to smear. Place the ground fat back into the freezer. Mix the Instacure #1 with a little water for uniform distribution and add it to the meat. Add the soy protein to the meat and distribute it with your hands. Add the remaining herbs and spices with a little water, then knead and mix the meat to develop the primary bind. When it becomes “sticky”, add the frozen fat to the mixture, folding it evenly throughout the mixture with your hands. Stuff the sausage into 4 7/8” red fibrous casings and clamp them with hog rings or tie them with heavy cotton butcher's twine. Place the sausages into a preheated 130°F (54°C) smokehouse for an hour, introducing hickory smoke. Raise the smokehouse temperature to 180˚ F (77˚C), continuing to smoke the sausages until their internal meat temperature (IMT) reaches 148˚ F (64˚C). The slow cooking will involve several hours. Do not try to speed up the process by raising the temperature. Remove the sausages, showering them with cold water until the IMT drops to less than 90°F (32°C). 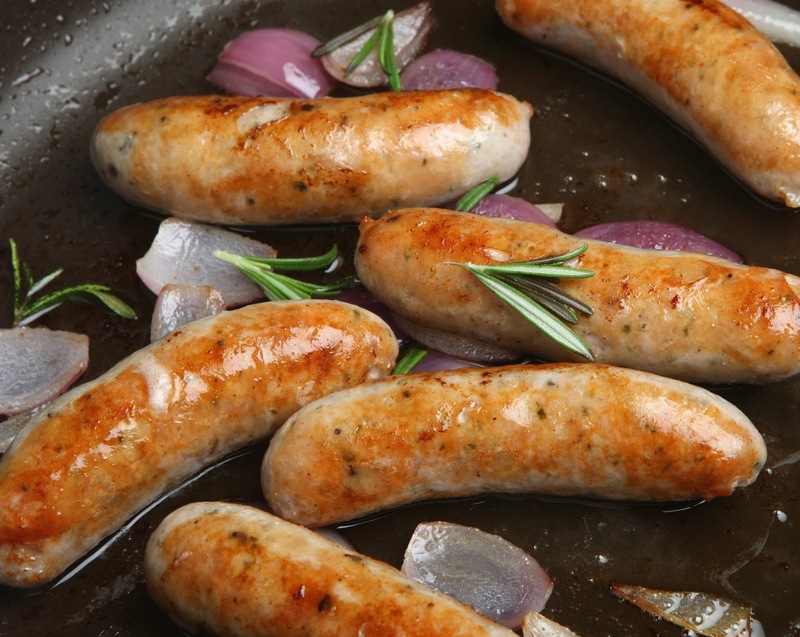 Refrigerate the sausages overnight before slicing half-inch-thick slices to pan fry for breakfast. Just "brown 'n' serve" them. If you do not wish to smoke the sausages, use your kitchen oven to prep cook them. Simply lay them on an oven rack and bake them at only 200˚ F (93 C) until the IMT reaches 148˚ F (64˚C) in about 5½ hours. *For best results, do not increase the cooking temperature beyond 200˚ F. If you like to eat this type of sausage served cold or sliced cold for sandwiches, then simply skip the prep-cooking and fully cook the sausage by making sure the IMT reaches 152˚ F (67˚ C) It is very important not to continue cooking much beyond this temperature, as the collagen will break and the fat will turn into liquid. At 170˚ F it's toast! If this happens, the texture of the sausage will resemble sawdust and taste worse. And listen up, pards… don’t you even dare try feeding it to your dogs if you spoil this sausage by overcooking it. The thing won't even make a good doorstop, so just bury it in a hole in the backyard and hope no one ever finds it! The secret of success: It will require nearly six hours for the IMT (internal meat temperature) to reach 152˚F (67˚ C). When prep-cooking (baking) this sausage, be sure not to exceed the oven temperature of 200˚ F (93˚ C). Again, have patience and do NOT try to rush the process by turning up the heat. The best solution is to use a probe-type thermometer with an alarm. When the IMT reaches 152˚F, be sure to cool it in ice water until it drops to room temperature. if vacuumed sealed and kept in fridge, how long can they stay. Or after the process can they be frozen?